A friend and fellow bourbon media colleague, Bill of Modern Thirst, started a group project of sorts with us and several other bourbon media folk. 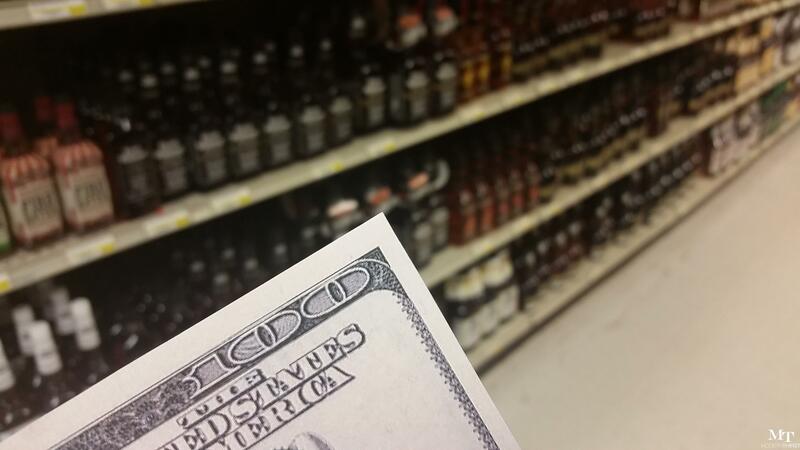 The premise is easy to envision: What would you buy if you had a Benjamin, a $100 bill, to spend on bourbon at the store? Rules: Disregard sales tax, only bourbon, rye whiskey, or American spirits (no beer or other spirits), no rare bottles (reasonably available), and that’s about it. Read Chris’ response here. First off, when people learn I have a bourbon podcast and blog, they’ll usually ask the polite, “Oh, really, that’s interesting, what’s your favorite bourbon?” A loaded question if there ever was one. I came up with my own standard answer, “It depends on what I’m doing and my mood.” A little dry and not very fun of an answer, but it’s the correct and 100% true answer for myself. So this question at hand is open ended. It wasn’t “What would you get 1) to bring to a nice dinner party to share, or 2) to a rowdy party, or 3) to give to an old friend…,” so I’ve had to come up with a general answer. I’m going to do my best to choose a number of bottles good for a variety of situations. My portfolio will be diversified so to speak. Essentially, this would be my list to give to intrepid bourbon/whiskey neophytes who want to drop $100 on a good spread, or for myself to have a decent spread on hand at home for any given occasion or mood. I have also limited myself to things readily and easily available year-round at most large liquor stores. So let me get down to it and tell you my choices and why I chose what I did. I’ll start with the most expensive choice. This is a solid sipping bourbon with a great flavor profile and a little kick with the higher proof. It goes great neat or with a large ice cube mellowing slowly. Knob Creek single barrel 120 proof will help you relax after a hard day, or celebrate with a solid readily available higher shelf bourbon. Simple as that. It’s still a great value at around $40, something that is becoming more and more rare nowadays. My next two choices are mainly for mixing. Everyone loves a good cocktail, and, especially with the craft cocktail boom, many people are just starting to experience how great a well-made cocktail can be, and these two choices are great for just that purpose. Bulleit Rye is an American rye whiskey, also readily available, that is excellent for mixing. Rye whiskeys in general tend to make better cocktails than bourbons, though not always. The spiciness of the rye whiskey compliments the various other ingredients common to cocktails: lemons, oranges, sweet vermouth, etc. If you haven’t made a Manhattan with a rye whiskey, you’re missing out, and a bottle of Bulleit Rye will get you started. Are there better ryes on the market? Sure, but they are also more expensive. So for this exercise, I’m going with Bulleit Rye. Old Granddad 114 (OGD114) is a high proof bourbon that is a great cocktail base. It’s high rye mashbill makes that no big surprise. The higher proof also helps it pack a bit more bite that I’ve found makes a delightful Bourbon Negroni (non-rye whiskey Boulevardier, if you like). I’m scared this one is going to go out of production, but hopefully not. My final choice is a good bottom shelf bourbon for when the night is no longer young, and you’ve already had a few better and more expensive pours (read, you’re a sheet or two to the wind). This is a bottom shelf bourbon we’ve touted before many times on our blog and podcasts. I can drink this on the rocks easy, and don’t mind mixing it with anything, especially Coke, as it’s so inexpensive. I would have chosen a 750 mL of Kentucky Tavern Bottled in Bond, 100 proof (usually around $11-13), but it went out of production in 2011, the distillery stocks were gone in 2013, and anything on the shelves today is the very last of the distributors’ stock. If you find any, definitely buy it, because it is gone for good now. So there are my picks for If I Had a Benjamin. It’s very easy to blow through $100 on bourbon or whiskey in general. These four picks are a good swath that would keep me going a while for my basic bourbon needs limited to $100 or less. Let us know what your picks would be, and, as always, Cheers! Old Forester Sig is a solid choice, too!